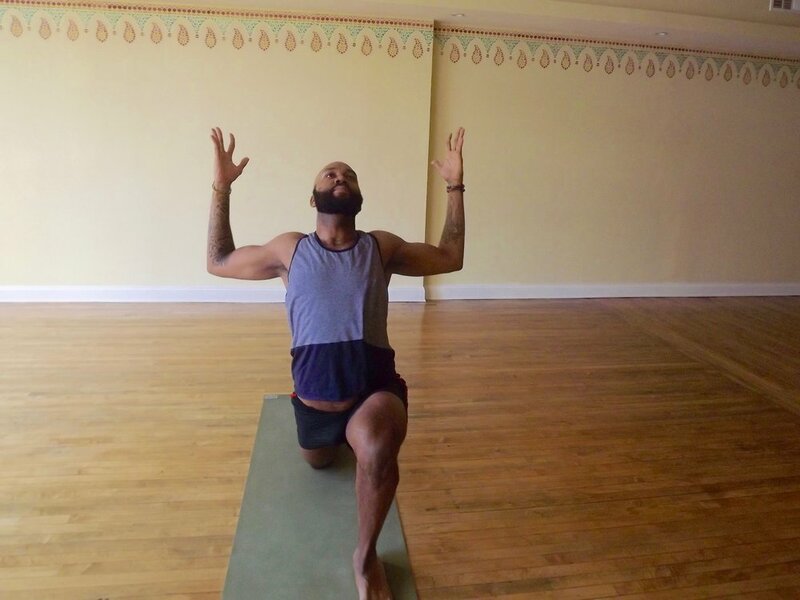 Led to yoga as a way to invite change in 2017, Lawrence has seen the practice change his life in many ways over the year. Along with the physical rewards, yoga has given him a new perspective on living, put him more in touch with his emotions and rekindled his spirituality. A true geek at heart, with a dash of hipster vibes, Lawrence hopes to share his love of the practice with others so that they can be healed. He is the new studio manager at Bhakti Yoga DC and will be traveling to India to get his 200 hr YTT certification. Random fact/favorite movie or book or word, food, etc.- Favorite movie- Scary Movie, all of the scenes with Brenda. What made you start practicing yoga? What brought you to it? I started practicing yoga to get myself into the habit of doing something regularly. I set the intention to practice three times a week so that I could earn myself a Fitbit. If I could stay consistent for six weeks, then I could do anything I wanted. Looking back, I believe I was brought to the practice to help fill a void in my life. Last year was rockier than I realized. I was operating in the space of excess and felt like I didn’t have control of my life. I’m appreciative of that journey because where I am now and where I will go in the future is worth it. What anchors your practice? Do you set an intention for yourself before you practice? My anchor has changed as my practice has grown. At first, it was the desire to change my routine; then it became a way of grounding myself and searching. Seeking for answers within myself and blissful grace and power of the Divine. I consider myself relatively new to the practice. I have to remind myself that it’s not about whether I can achieve that exact shape or hold for the specific amount of time. It is the opportunity to be gentle with myself and abandon the attachment to my ideas of how my life should be. Ultimately, it is the means to better myself in small incremental steps so that in time, I can be of better service to others. The most significant challenge I’ve encountered is the desire be perfect. On the mat, it shows up in wanting to do that exact pose or beating myself up because I can’t silence my mind. Off the mat is has been the attachment to time-sensitive goals that I’ve placed on myself. The most changing aspect of your journey? Yoga has transformed my life in my ways than I could have never imagined. I’m more conscious of the power I possess. I’m more intentional in my choices and have developed a more profound spiritual practice. By being easier on myself, I can only hope that the energy I receive is given off freely to others. There’s enough good energy for everyone. Through unlocking some of my emotional holds, my sense of empathy has increased. I feel more connected to others and experience my own emotions on a deeper level. Krishna carries what we lack and preserves what we have; this has been evident in my practice on days when I’m feeling frustrated. As I rise into warrior 2, windmilling my arms, washing away all of the negative feelings I had, settling into the pose, I feel lighter and closer to a state of bliss. Find what feels right for your body and be kind to yourself. Know that there is yoga for everyone. If you want an approachable practice, there are classes for it. If you are looking for yoga to make you sweat, there are classes for it. If you want to heal, yoga is here for that. Yoga has taught me to be present in the moment. It has given me breathing exercises and mantras to ground myself when I’m lamenting about the past or filled with anxiety about the future. In general wellness, it has made me more aware of my body so that I’m able to recognize the difference between discomfort and pain, which is very helpful for my weight training. Internally I have become more mindful of my thoughts and actions. I’m better equipped to navigate through life with an understanding that the nature of life is periods of highs and lows. Physically, it’s been great to see my body change and be able to move in ways that I couldn’t earlier this year. I’ve also rediscovered my spirituality on the mat which gives me a sense of belonging and purpose. The lack of representation can make it feel like we don’t belong. It can make getting to the mat very challenging, especially in a classroom. In our society; our beings are criticised by systems of oppression that weigh heavily on us. Sometimes this weight becomes psychosomatic, causing a variety of other health issues across the mental and physical beings. Yoga has the power to heal and that healing is necessary. One of the apprehensions I had about attending a class was that I wasn’t very comfortable with my body. I had a certain level of physical activity while in college but had become a lot more sedentary in the recent years. I was intimated to be in a space where people with slim bodies contorted in different shapes while I couldn’t even touch my toes. I am thankful for my friend Simone for inviting me to her class because it was my first and laid the foundation for what I came to expect in my practice. We are under-represented in the marketing. It tells people that the space is not for us. So when we go to class, we are sometimes met with unconscious hostility which undermines the practice. This also plays out in our own community where our peers see the practice as only for white people and don’t want to practice. I want to work to dispel both parts of this because what I’ve experienced is meant for EVERY ONE. Find the mat that works best for you and don’t be afraid to man an investment. Also, for home practice, get a block to help assist with openers to give yourself some care. 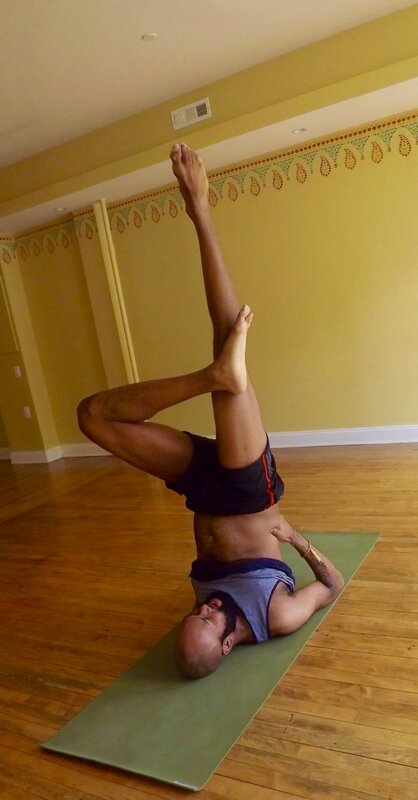 Follow Lawrence's Journey on instagram @here_2infinity and visit Bhakti Yoga DC to practice and learn about this kind of yoga!